Toronto, a city that sets precedents in many regards, did the same nearly 30 years ago when it came to the art world, and adding a creative component to our communities. The most recent condo that I lived in had the benefit of being impacted by the Percent for Public Art Program. Specifically demonstrated by the physical structure of oversized book pages just steps away from our lobby door. It was a welcome addition to our community, particularly since it gave my children another space to venture and to play hide and seek. They darted in between life size book pages and eagerly read the inscribed names, desperately hoping to see one that matched their own. Some Torontonians aren’t fully aware of the Program, supported by our city, which aims at enhancing our neighbourhoods and ensuring that everyone visiting and living in our city has the ability to enjoy its art. It was in 1986 that Toronto began its endorsement of public art and encouraged developers to “give back” to the city in which they were building. We were actually the first Canadian city to adopt a program where public art is part of the planning process required for private development. There’s great logic to the fact that if you integrate art at the early, conceptual stages of a community, it makes it a feasible and cost effective opportunity for all. 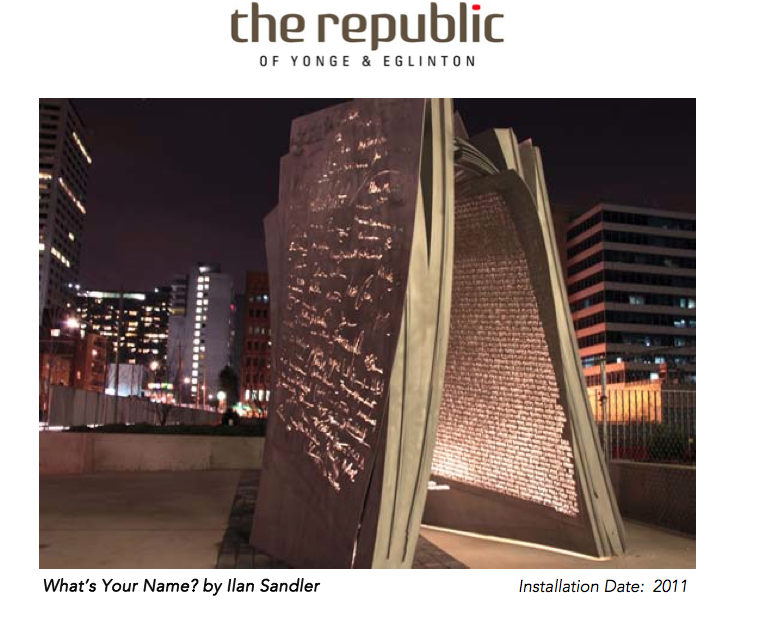 The policy was officiated several years ago under Section 37 and is now more commonly known as the Percent for Public Art Program, where developers literally set aside a minimum of 1 per cent of their gross construction cost budgets toward public art. They have the choice of money going directly toward an art installation on or nearby the development site, or having the money set aside in the city’s Public Art Reserve Fund. There’s also the option of doing a combination of the two. There is of course, a protocol as to how all of this works. The City plays a large part, especially when the option is to place the art “on site” but it’s definitely not a sole effort. There’s a great deal of collaboration with developers, municipalities and artists all playing a significant role. Community and urban designers become intimately involved with development reviews, official plan amendments and even rezoning at times. The first party that’s often consulted is the architect of the site – to gauge where the best location might be, followed by an art consultant who helps comprise a portfolio of suitable artists for the project. Narrowing down the list among the many applicants is no small feat and takes time and thoughtful consideration. that there’s a fair and professional method for art/artist selection. Additionally, other members of the process in its entirety may include landscape architects, communications and media consultants, a project manager, and even lawyers specializing in art. Those are some of the technicalities. As for the aesthetics, we often tend to think of large sculptures when we think of public art. 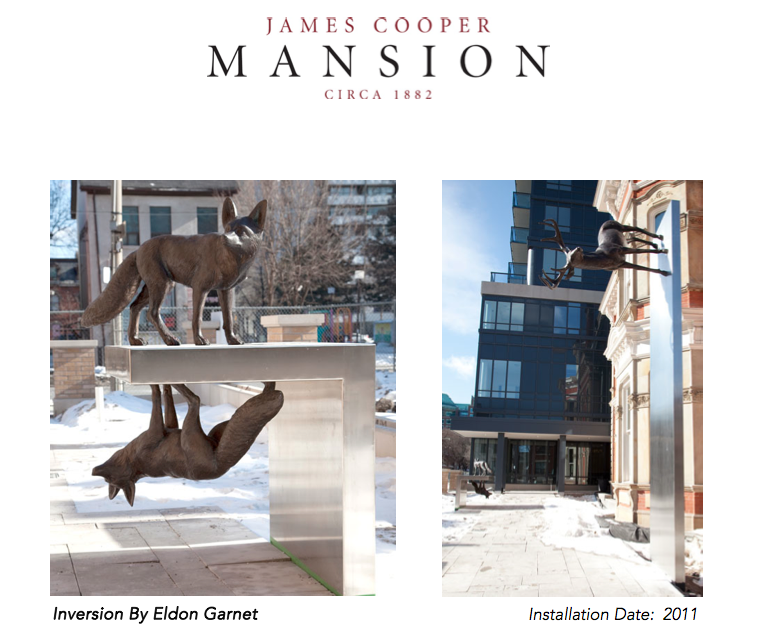 One of my favourite sculptural applications is below at James Cooper Mansion. Public art however, can be in many forms. Landscape, architecture, fountains, to name a few. The art is sometimes even embedded in the buildings themselves via glass artwork or in surrounding areas such as pavements nearby. 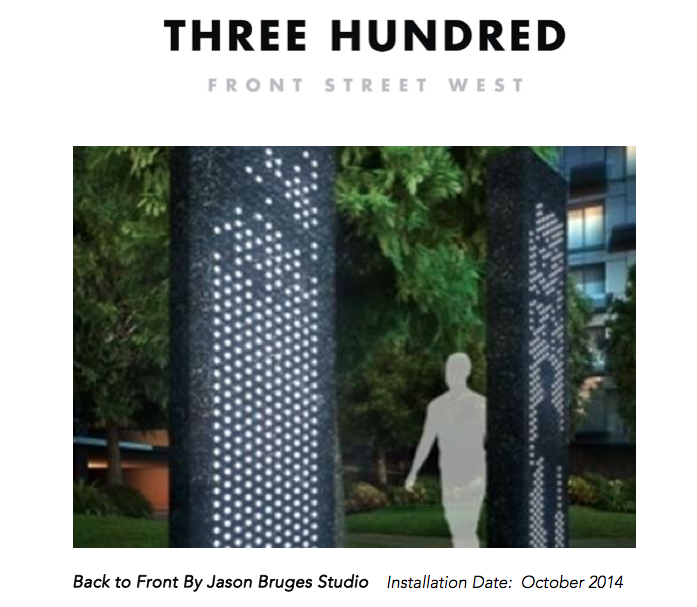 Lighting is also a popular medium, as seen below which was done extremely well at the 300 Front community in downtown Toronto. This piece is ever-changing and fluid since it’s impacted not only by the natural and built landscape surrounding it, but also by passersby, casting shadows and filters upon it. This is a reminder that art is also often an invitation for people to participate in it and therefore serves to be functional in design, think of seating for nearby pedestrians. These artistic additions to communities not only add an interesting component to our urban landscape, but also help to give our city recognition as an international public art realm. We already have over 200 public art installations that have come to our city through this program and we look forward to more. Every new condominium community brings with it, the opportunity to add to or improve an existing space. When developers take advantage of this and aim to fashion mixed use functional places that cater to the residents living within them, it’s really a win for everybody in the community and the city as a whole. Previous Post Better Buildings Save Lives.